2 weeks, 2 flights, 5 time zones, 3000 miles on the road and countless Red Bull’s crushed… where do I even start? Crewing the Race Across America was an experience unlike anything else. I thought I set my expectations fairly well going into the race, but there are something’s in life you can’t prepare for without first hand experience… and RAAM is one of those things. I am officially a race ambassador for the Vitality British 10k this year! Having run in this race before, I’m more than happy to sponsor the event. With 15,000 runners, the course is a bit crowded at first but the atmosphere and the iconic landmarks that we pass along the way make up for the slow start. Actually, regardless of the slow start, last year I managed to finish the Vitality British 10k with a personal best! I was completely over the moon about breaking into the ’45 minute club’ with a finish time of 45:30. My personal best prior to that was 46:26, which I had been trying to beat for some time (over two years). I’ve now realised that I haven’t raced 10km since… which is a little scary. Knowing that I will be on the same course – doing the same distance – at the same time of year… There is no reason I shouldn’t be at least the same speed as last year right? Wrong! Whether your personal best is on a 5k course, 10k course or longer distances, there are so many factors to consider during a race and you should never start a race with an expectation to perform the same, feel the same or realise the same results that you had in the past. Last weekend we packed up our gear and drove to Wales looking for a chance to get out of the city and see part of the UK we’d never experienced before. A road trip only one week after completing The Sugar Free Challenge was a risk… who doesn’t like to snack en route? Luckily, a 4-hour walk/scramble up Mt. Snowdon the next day seemed to balance everything out. I’ve learned that I’m much better at the big picture of healthy living… micromanaging my diet last month has thrown me out of joint a bit. Snowdon is the highest peak south of the Scottish Highlands. The trails to the top are straight forward in terms of navigation but the terrain becomes quite steep and rocky as you progress up the mountain. Despite the very random weather Northern England often has to offer, yesterday morning was absolutely beautiful. Driving up the steep and swervey Sutton Bank – a 25% gradient – your ears begin to pop. I’m not the best passenger when driving on UK roads (understatement of the century) as I often feel car sick… the swerving, the roundabouts, the opposite-side of the road, and now my ears are popping…. Getting to the top of Sutton Bank required a whole other level of concentration for me to not feel sick. Well I made it (surprise! Obviously Allison…). And I have to say, it is quite quick to the top and the sights are well worth the journey. What a stunning view of Yorkshire it was. 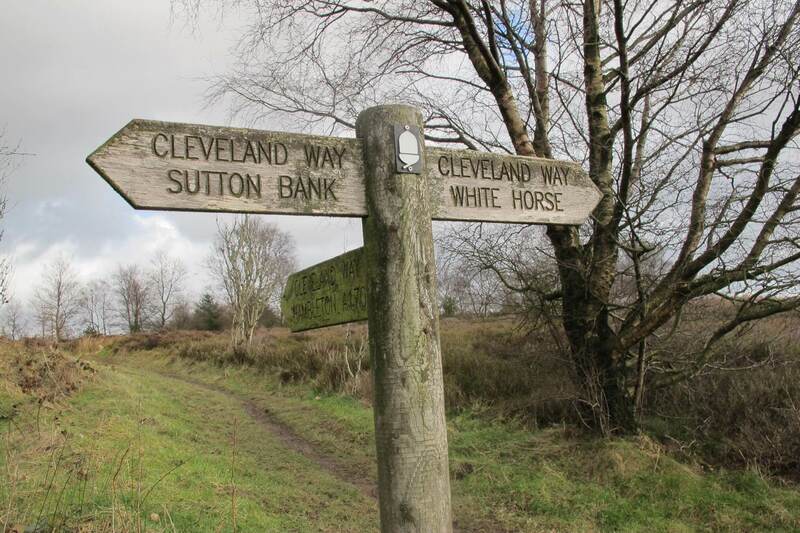 I started my run at Sutton Bank running along Cleveland Way until White Horse and then back again! It was a short run (around 6kms) with wicked sights and simple navigation. I would actually recommend this route as a walk, rather than run. The view is too beautiful to run by and the distance is perfect for a social walk with friends or family. No walking guide or experienced hiker needed – not like the Lake District (blog post here).